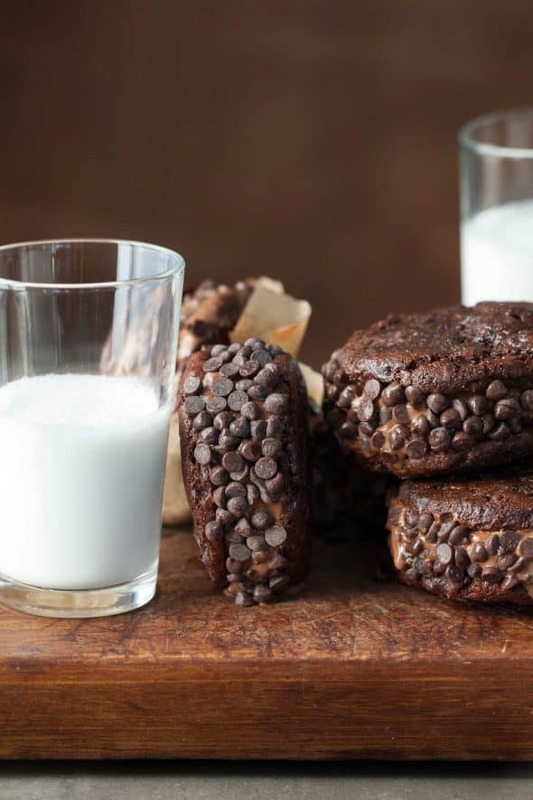 Creamy vegan chocolate ice cream is sandwiched between two double chocolate cookies and rolled in mini chocolate chips. What could be better than a cookie? How about two cookies with a big scoop of ice cream in the middle? I thought so. While biting into an ice cream sandwich certainly brings back fond childhood memories, this is one treat you’re never too old to enjoy. 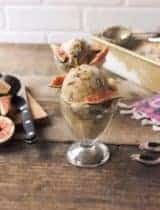 It’s the perfect marriage of two timeless desserts, both excellent in their own right but together transforming into something altogether different and even more outstanding. 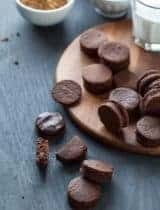 First there are the cookies; you need a cookie that’s sturdy enough to stand up to being filled without crumbling but soft enough that you can bite into when frozen. 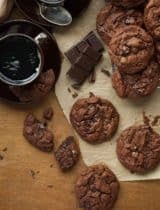 I like to use these vegan double chocolate cookies , they’re soft and chewy on the inside with a rich chocolate flavor. 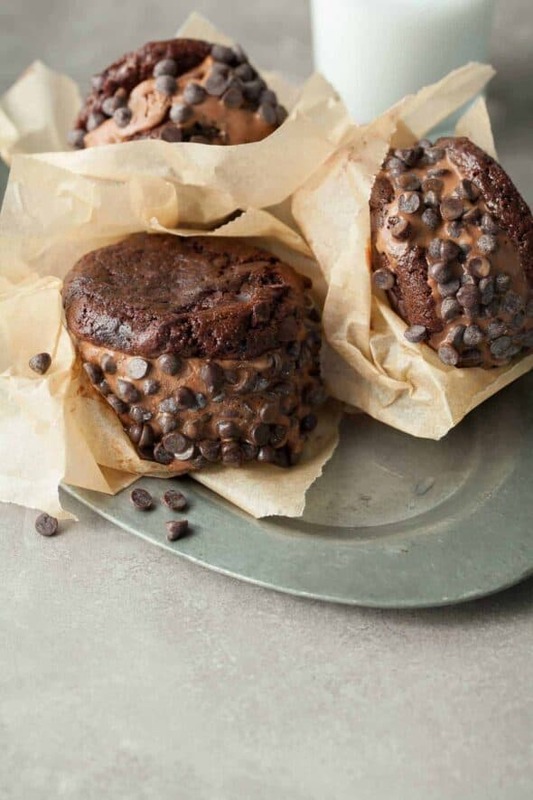 I also under bake them for a minute or 2 when making ice cream sandwiches to ensure they are extra soft and brownie-like. 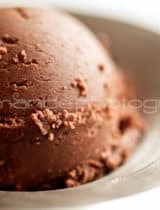 Next up is the ice cream; I’ve gone for a rich and creamy vegan chocolate ice cream to make these extra decadent, because there’s no such thing as too much chocolate. 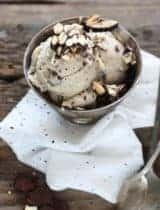 A combination of cocoa powder along with melted chocolate is what gives this dairy-free ice cream its rich texture and dark chocolate flavor. It’s thick and velvety like gelato and tastes so creamy you’d never guess there wasn’t a drop of cream or milk in it. Grab two cookies and an ice cream scoop and you’re almost there. Roll the edges in miniature chocolate chips for decoration if you’d like and into the freezer they go to chill! 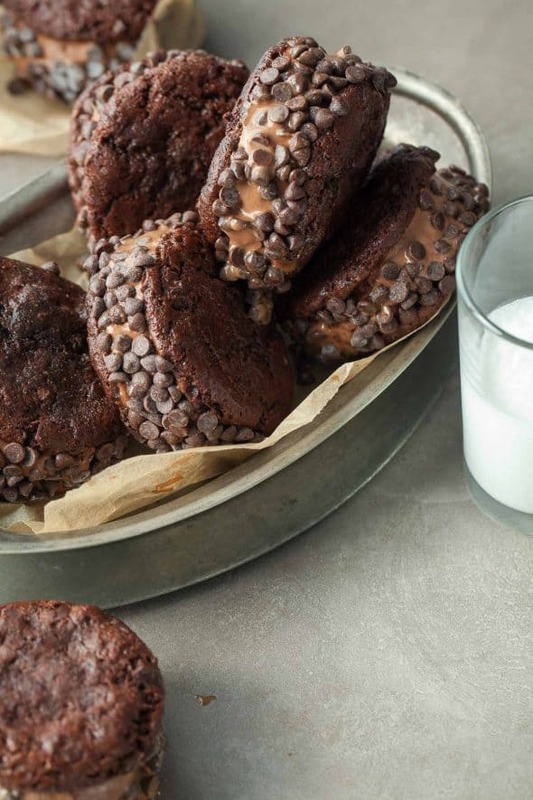 Place chocolate chips and water in a small skillet and melt stirring constantly over low heat. 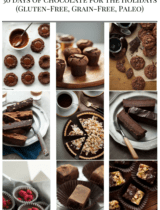 Place melted chocolate, cashews, dates, coconut milk, date syrup, cocoa powder, vanilla extract, and sea salt into a high speed blender and blend until smooth and creamy. 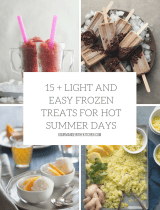 Chill in fridge until cool to the touch or pour mixture into a heat proof bowl and place bowl in an ice bath to cool quickly. Pour into an ice cream maker and process according to the manufacturer's directions. Place in freezer to allow the ice cream to harden. When ready to make ice cream sandwiches place a large scoop of ice cream between 2 cookies and press gently. 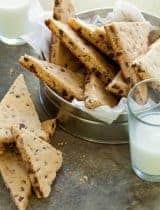 Roll the sides in mini chocolate chips and transfer sandwiches to freezer until firm.